Henrietta’s oldest son, born soon after her fourteenth birthday, Lawrence is drafted into the army at age sixteen after lying about his age. He eventually has children with and marries Bobbette Cooper, who helps raise his younger siblings after Henrietta dies. Henrietta’s second son, Sonny suffers after his mother dies; he joins the air force and is eventually honorably discharged, but then is later jailed for narcotics trafficking. The gynecologist who treats Henrietta’s cancer, Howard Jones allows Dr. George Gey to take samples from many of his patients, including Henrietta. After Gey’s death, he collaborates on an article about the HeLa cell line. A researcher at Hopkins, he hears about Rebecca’s research and is appalled that Henrietta hasn’t received more recognition. To thank the Lackses, he creates a colored print of Henrietta’s chromosomes magnified by a high-powered microscope. He gives the print to Deborah, who in turn gifts it to Zakariyya (Joe). Henrietta’s cousin and one of her closest friends, Margaret lives near Johns Hopkins, and Henrietta stays at her house after her treatments. She supplies Rebecca with many memories of Henrietta. One of Henrietta’s cousins and closest friends, Sadie has many memories of Henrietta that she shares with Rebecca. George’s wife and fellow researcher, Margaret has trained as a surgical nurse, and believes that creating a sterile environment is crucial to encouraging an immortal cell culture. Twenty-one years old and working at George Gey’s lab, Mary processes Henrietta’s cell sample despite her initial belief that the cells aren’t going to grow. She is chosen for Gey’s lab because of her deft, delicate hands. Dr. Howard Jones’ supervisor at Hopkins, TeLinde is one of the top cervical cancer experts in the country, and advocates for an aggressive treatment approach. Rebecca’s professor at community college, he is the first person to mention Henrietta’s name to her, as he includes a discussion of the HeLa cell line in a lesson about cancer. A microbiologist who worked with Gey when he took samples from Henrietta. Aurelian claims that Gey told a dying Henrietta that her cells would save the lives of countless people, and that Henrietta was moved by the news. The surgeon who operates on Henrietta’s cervical cancer, though he first collects samples of her cancerous cells. Lawrence Lacks’ wife, who helps to raise the Lacks siblings after Henrietta dies and Ethel’s abuse is uncovered. Deborah’s childhood crush. He eventually marries her, but soon after begins abusing her, and they eventually separate. Deborah’s second husband. He is a car mechanic before becoming a preacher. Though the two eventually separate, they remain close. Deborah’s son, who spends his life in and out of jail. A geneticist who finds a major problem in cell culturing: HeLa cells have contaminated all eighteen of the most commonly used cell cultures in the world. A French surgeon at the Rockefeller Institute in the early 20th century. Carrel is a famous scientist who wins a Nobel Prize for his work, but he is also a racist and a eugenicist. The scientist who disproves Carrel’s work. The first reporter to write about the Lackses. His article in Rolling Stone features Henrietta in 1976. Henrietta’s grandfather, who raises both her and her future husband, Day, from childhood. Fred’s brother, and co-owner of a convenience store. He’s a cousin of Henrietta’s, he works in the fields with her and Day during their childhood. Impoverished by the time Rebecca meets him, he eventually shows the author where Henrietta is buried. Henrietta’s cousin. This giant man is so in love with her that he tries to kill himself several times to prove his affection. Henrietta’s sister, who believes that Day isn’t good enough to marry Henrietta. Henrietta’s father, who gives up his children to different relatives after his wife Eliza Pleasant dies. Henrietta’s mother, who dies in 1924 in childbirth. Having made millions as a banker and grocer, Hopkins donates $7 million to start Hopkins Hospital for the Poor, specifically hoping to help black patients. A Greek researcher who invents the Pap smear, a crucial test in detecting and combating cervical cancer. The doctor who pioneers the use of radium in treating cervical cancer. Henrietta’s cousin and Galen’s wife. Ethel hates Henrietta but moves into her house after Henrietta’s death. Ethel abuses and starves Henrietta’s children, but saves the cruelest treatment for Joe. Ethel’s husband, who lusts after Henrietta before she dies. After Henrietta’s death, he sexually abuses her daughter Deborah. A local woman who owns a grocery store and has created a foundation to build a Henrietta Lacks museum. A sociologist at Morgan State University who works with Courtney Speed to help get recognition for Henrietta. A local minister. Jackson helps Rebecca to find Courtney Speed. The president of the National Foundation for Cancer Research. He organizes a conference in Henrietta’s honor and invites Deborah. As the director of performance and improvement at Crownsville, he helps Deborah and Rebecca find records on Elsie. A graduate student who works for McKusick, she attempts to obtain genetic samples from the Lackses. She does not communicate with them, however, and so they remain unaware of the purpose of the samples. A Harvard anesthesiologist who publishes a study in the New England Journal of Medicine calling hundreds of scientific studies unethical. A Navy doctor working at the National Cancer Institute. He witnesses normal transplanted cells becoming malignant. A renowned cell culturist who publishes a paper about how normal cells become cancerous. A virologist who becomes concerned that humans can contract cancer from HeLa, and tests his theories on cancer patients and prisoners. His experiments are eventually condemned as immoral. The director of medicine at the Jewish Chronic Disease Hospital in Brooklyn. He makes an agreement with Southam allowing him to conduct research on patients, but other doctors protest the deal and the experiment is eventually condemned and halted. A lawyer on the Jewish Chronic Disease Hospital’s board. He becomes concerned about the Southam experiments. The New York Attorney General who launches an investigation into Southam and Mandel’s research, accusing them of fraud and unprofessional conduct. A Swedish cancer researcher who injects both himself and his patients with HeLa cells for the purposes of experimentation. A researcher and Southam’s colleague. The patient whose case provided precedent for the idea of informed consent. A scientist involved in the meeting about HeLa contaminating other cells. He eventually becomes the president of the American Type Culture Collection. A geneticist from the University of Texas, and the chair of Gartler’s conference session. The creator of the Chang Liver Cell Line and a Harvard scientist. He is dismayed to find that his cell line has been contaminated by HeLa. A chromosome expert and director of cell culture at the Naval Biomedical Research Laboratory, Nelson-Rees discovers that cells claimed by Russian scientists to have a cancer virus are actually HeLa. A researcher at the NIH who uses HeLa to develop a standardized culture medium that can be made by the gallon and be shipped ready to use. The owner of Microbiological Associates. He helps to make cell culturing a profitable industry. A researcher and business partner of Reader’s who helps use HeLa to create an industrial-scale, for-profit cell distribution center. One of George Gey’s colleagues on the NFIP advisory committee. William Scherer’s adviser in Minneapolis. A leading geneticist at Hopkins. He helps write an article about the HeLa cells line in tribute to Gey after the researcher’s death. A press officer at NFIP who insists on releasing Henrietta’s name in an article about cell cultures. A reporter from Collier’s Magazine. He contacts Gey for information about Henrietta, but eventually gets her name wrong in his article. 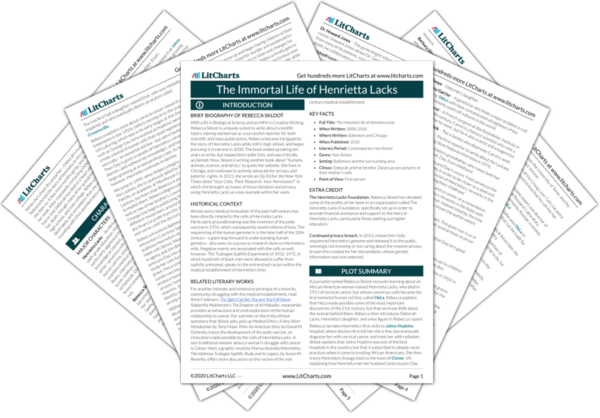 A researcher at Brunel University who writes a letter to Nature about HeLa and Henrietta’s anonymity. A researcher who fuses HeLa with mouse cells, thereby creating human/animal hybrids with his partner John Watkins. A researcher who fuses HeLa with mouse cells, thereby creating human/animal hybrids with his partner Henry Harris. After he contracts leukemia, his cells are used to make the Mo cell line, which eventually becomes immensely profitable for David Golde. Moore ends up suing Golde for the profits. A researcher at UCLA. He investigates John Moore’s tissues, and eventually develops a cell line called Mo that makes him millions. A scientist at GE, he creates a bacterium that can clean up oil spills but is at first denied a patent because a bacterium is a living organism. Eventually, however, he wins his case because the bacterium wasn’t naturally occurring. A hemophiliac who was repeatedly exposed to hepatitis B through contaminated blood. He has large quantities of antibodies in his system to fight the disease, and eventually sells his blood serum to help find a cure for the illness. A Nobel Prize-winning virologist, he enters into a years-long partnership with Slavin that eventually leads to his discovering the hepatitis B antigen and creating the first hepatitis B vaccine. He referees the depositions in the case of John Moore against David Golde. The author of a book about HeLa contamination that eventually makes its way to the Lackses. The discoverer of HPV, the virus which caused Henrietta’s cancer. A Nobel Prize-winning molecular biologist, he infects HeLa cells with HIV in order to understand the virus’s infection process. An author and activist against the manipulation of DNA. He sues to halt Richard Axel’s research. An evolutionary biologist at the University of Chicago. She posits that the HeLa cells have become their own species. A BBC producer who makes a documentary about Henrietta. As the curator of the Smithsonian National Museum of American History, he helps to organize a small event in honor of Henrietta. A U.S. congressman who speaks in the house asking for Henrietta to be acknowledged as the donor of the HeLa cell line. William Brody is the president of Johns Hopkins when the Lackses (with the help of Wyche) try to get acknowledgement from the hospital. An attorney at Hopkins who eventually exposes Cofield as a fraud. A pathologist who is listed in Cofield’s lawsuit. A Hopkins spokesperson who speaks to Rebecca. A molecular biologist and chief of staff at the NIH who talks to Rebecca about privacy issues surrounding stored samples. The director of the Division of Genetics and Developmental Biology at the National Institute of General Medical Science, she discuss issues surrounding the donation of tissues with Rebecca. A physician and lawyer, and director of the Center for Biomedical Ethics and Society at Vanderbilt. She seeks a public debate about researchers’ possession and use of patients’ tissues. The director of the Institute for Science, Law, and Technology at Illinois Institute of Tech. She wants conscientious objectors to refuse to give tissue samples. The vice provost for research at Harvard, who believes that giving patients power over their tissues is shortsighted and ultimately impossible. The director of the Diagnostic Molecular Pathology Laboratory at UCLA. He is an opponent of tissue research consent, believing it to be unfeasible. The founder of a biomedical ethics center at the University of Iowa, he favors fewer lawsuits and more disclosure by researchers. A professor of microbiology and immunology at Columbia, he is horrified at the idea of restricting HeLa cell use. The president of the United States from 1969-74, Nixon signs the National Cancer Act into law and launches the War on Cancer. Part of the husband-and-wife team that discovered radium and its ability to destroy cancer cells. A researcher who invents the polio vaccine. A friend of Bobbette’s. Her brother-in-law reveals the truth about the HeLa cell line to Bobbette, who then shares it with the Lacks family. A cleaning woman local to Baltimore whose job it is to keep the Geys’ lab spotless. Gladys’s son and Henrietta’s nephew, he blesses and prays with Deborah after she visits Crownsville. Henrietta’s cousin, who is partially paralyzed because of polio. A cousin of Henrietta’s, he helps organize her relatives to donate blood for her. A man in the Lackses’ neighborhood. He threatens Joe, but Joe eventually stabs and kills him. A friend of Joe Lacks. The midwife who delivers Henrietta in 1920. The midwife who delivers Day. Mourning’s son, and Henrietta’s great grandfather. Edmund’s daughter and Henrietta’s great aunt. Henrietta’s maternal great grandfather, who is white. A slave, and the mother of Albert’s children. The white man who owned both Mourning and her husband. One of the oldest white Lackses in Clover, he is a distant cousin to the black Lackses, but says racist things about them. One of the oldest white Lackses in Clover, she is a distant cousin to the black Lackses, but says racist things about them. A man who welcomes people as they arrive in Clover, he directs Rebecca to Lacks Town. The first owner of a tractor in Clover, Henrietta’s childhood home. Hoyt-Disick, Gabrielle. "The Immortal Life of Henrietta Lacks Characters." LitCharts. LitCharts LLC, 29 Jun 2016. Web. 22 Apr 2019. Hoyt-Disick, Gabrielle. "The Immortal Life of Henrietta Lacks Characters." LitCharts LLC, June 29, 2016. 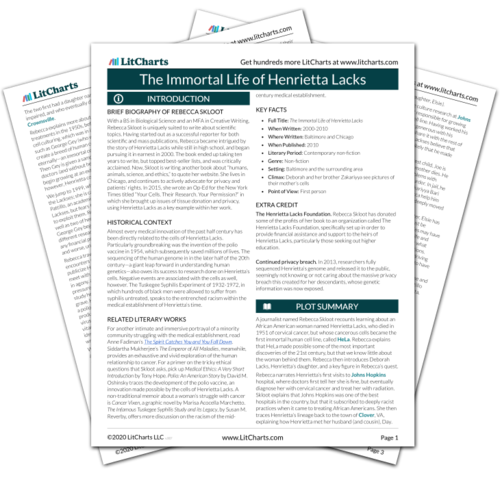 Retrieved April 22, 2019. https://www.litcharts.com/lit/the-immortal-life-of-henrietta-lacks/characters.